Secretin is a gastrointestinal peptide hormone that was first identified by Jorpes and Mutt in 1961. Secretin and other members of the VIP family of peptides have been studied and reported in the literature. The primary FDA approved clinical indications for the previous marketed porcine secretin were:1) Exocrine Pancreas Function Test; 2) Zollinger-Ellison Syndrome Test, and 3) Stimulation of pancreatic secretions to facilitate the identification of the ampulla of Vater and accessory papilla during endoscopic retrograde cholangio-pancreatography (ERCP). ChiRhoStim® (Human Secretin for Injection) is approved, for the diagnostic indications of exocrine pancreas function test, facilitated cannulation during ERCP procedures, and Zollinger-Ellison Syndrome test. 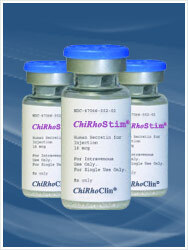 ChiRhoStim® (Human Secretin for Injection) is reconstituted with eight (8) mL of saline for injection. Use immediately after reconstitution. Discard any unused portion after reconstitution.